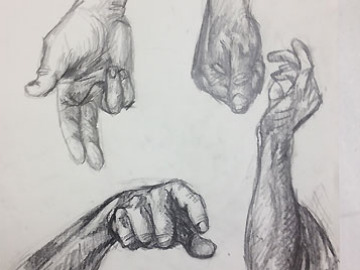 This program is designed for students who are applying for art schools and colleges, are preparing for auditions, and need help with portfolio preparation, but also for any student who is deeply interested in improving their art skills in the area of drawing, painting, and/or sculpture. Individualized plans and projects will be available. Students will work closely with mentor Anita Sulimanovic, MFA who will help them in getting skills necessary for auditions, will offer help with portfolio preparation and intensive instruction in their areas of interests. Our typical classroom features hardworking students who can quietly focus on their projects for multiple hours. Although there is no audition for this program, if you have a specific goal or reason for applying but are unsure if it is appropriate for you, please contact Anita at studiosuli@gmail.com outlining your reason for participation including any questions you may have. Students can enroll in three-days or six-days sessions. There will be no repeating projects (unless otherwise agreed upon). Tuition: $180 for three days or $350 for six days.